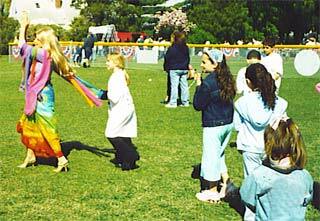 The Lady of the Rainbow where children participate in her unfolding story and uplifting songs! While echoing her words in Smile And See, the children learn about the wonderful echo effect of smiling and being kind. Everyone has an exhilarating experience lifting a rainbow parachute with The Lady of the Rainbow, while she inspires them to Brightly Color Every Day by being a good person, finding happiness, and spreading it to others. Using vivid hand and body movement, they feel the momentum and joy of growing and learning in The Tree of Life, an uplifting song focusing on believing in yourself, taking one step at a time, and reaching out to one another. 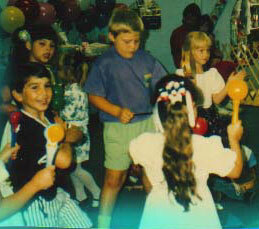 Dancing and using colorful props, the children partake in a multi-cultural experience in several songs, including All Hearts United, which is sung in many different languages about the joy of sharing and being connected to each other. Skipping, clapping and spinning in a procession, the children follow The Lady of the Rainbow and realize that they shouldn’t worry about making mistakes because That’s How We Grow. The lively procession continues As We Go Along, a song that emphasizes team spirit, staying positive, being patient, and learning to concentrate as we play The Game of Life. The children go on a journey into the realms of the sea. Hearing The Lady of the Rainbow blow a conch, the excitement builds during the songs Listen to the Call and Change Things Magically. 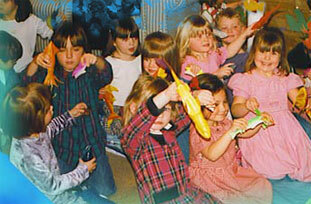 Children delight in holding toy sea creatures, listening to ocean waves and music, playing calypso instruments, and dancing as bubbles float into the air. In her story and song, The Lady of the Rainbow explains the amazing process of transformation. Just the way an oyster takes an ordinary grain of sand and changes it into an exquisite pearl, we too can transform something ordinary or unpleasant into something beautiful and precious!